Chandelier or any other lamp is an integral part of any interior. Electric light is able to highlight what we wanted to show and hide the flaws of the decor of the room. It is not always possible to buy the chandelier, which was the dream - or does not allow or, paradoxically, with all the richness of choice is not the one! Try to redo your tired old chandelier using inexpensive available materials. Old chandelier (working), chains of different sizes, glass or crystal pendants and beads, artificial flowers, glue, and various decorative items, beads, flower pots, acrylic paint. If your old chandelier had a fabric lamp shade that burned or frayed, do not rush to buy new or sew the same version but from a different cloth. Instead, decorate the chandelier beadwork, carefully criss-crossing the frame chandeliers around the perimeter. The transparent beads pick, electric light can pass through the glass beads. From a simple light bulb Ilyich, hanging on a thick black wire, and strainer on legs you can build a stylish lamp in the style of hi-tech. Take the cartridge with a traction nut, make a hole of suitable diameter in the bottom of kitchen utensils. Here and the ready lamp, which you will boast about to friends. The same principle of operation applies for lamps with shades from flower pots. The lamp in the pictures used ceramic pots, but can be applied to plastic and paint them manually. Or take the openwork pots, which are placed on top of the normal. Pitch of the cartridge with a super original bulb chandelier using a dense page of the book. On a thick copper or steel wire of the two expanding coils hang paper houses, glued the pages of the book. The more houses, the more original it will look a chandelier! Normal shesterikova chandelier, you pretty boring, adorn with colored glass pendants and beads. Small, colored glass, the vase and put it on the rack chandeliers and colored sockets for jam or ice cream dish will come in handy as additional decorations. 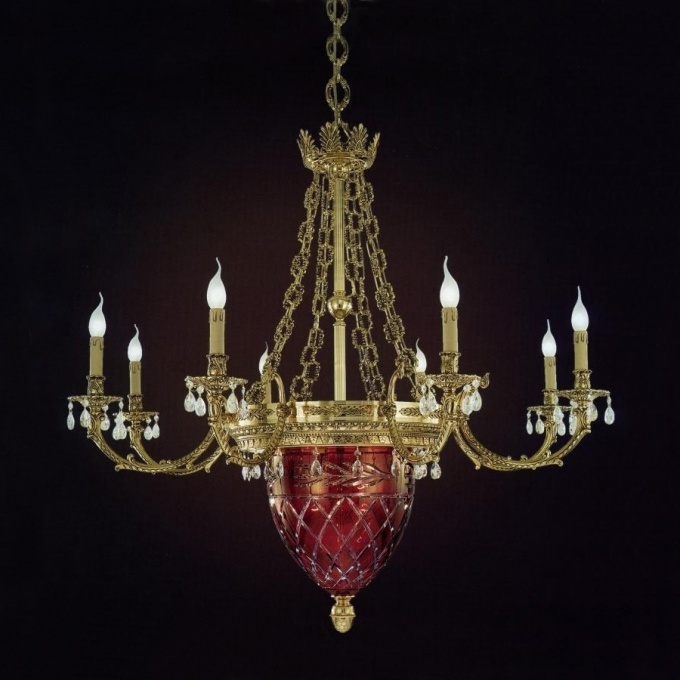 You'll have a chandelier in Oriental style, like in the fairy tales of Scheherazade! For nursery girls paint the frame of the chandelier in rich pink color, and miniature absurdity in lime green with pink polka dots! Your daughter will be delighted, think with her together, in her room can be converted in the style of a new chandelier. Try to paint in these colors photo frame and trunk for toys. Boring white shade kitchen chandelier decorate fluffy white flowers. For this white balls through a hole in the middle of the artificial flowers glue them with white glue to the ceiling. Flowers you can take and not white, and colored, and even different colours on one canopy. Can be sprayed on top of acrylic paint. If you use paper in the manufacture of decorative lampshades, light bulbs, insert a low power. The ceiling with straight glass you can stick colourful tape, simulating stained glass.